Some deliciously freaky drawings in this chapter! If you missed Part One and Part Two, just click on the images below to get caught up with the story! …and now we continue with Chapter Three! …click HERE for Part Three! Back when Betty Boop was a dog and Bimbo was tall: It's one of my favorite Fleischer cartoons, "Dizzy Dishes," animated by Grim Natwick (creator of Betty Boop) and Ted Sears. Look at the LOVE as Bimbo the waiter dances across the floor to take an order. I love how he takes a bow for the applause meant for the chorus girls! And check out the freaky painting at 1:03 ...and that song! as each customer barks his order in turn: "One roast lamb!"... "I vant HAM!" 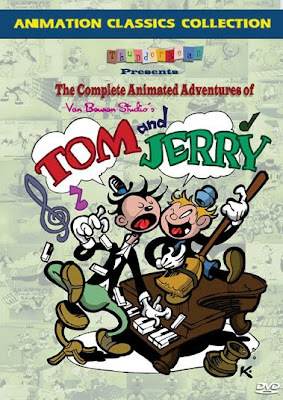 The ending is as ridiculous and surreal as you would expect from early Fleischer cartoons. I love the unpolished vocal performances, too. At times Bimbo talks without even ANY attempt at making his lips sync...or even move at all. The Fleischers new that "funny" was more important than "polished," even though oftentimes they had both. This is just one of those cartoons I can watch over and over ^_^ Every time I see it I discover gags and visual treats I had never noticed before. If you click on the video (after it starts playing) it'll jump you to YouTube where you can watch it BIGGER. Which I recommend. If you have a good connection, click on the red HQ button to see it in the best quality. Now that YouTube has grown up in quality, there are seemingly thousands of fun and rare cartoons waiting to be discovered there. ENJOY! Vintage funny animal comic book scans! Is this the end of Felix?